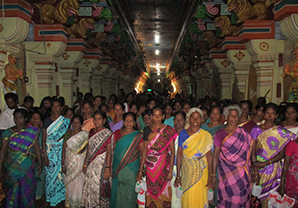 As a part of women empowerment initiatives taken by Sri Aurobindo Rural & Village Action & Movement (SARVAM), 350 women visited the ancient Indian cities Rameshwaram and Madurai from June 18 to July 2, 2015. This was an all-women trip whichwas for most women a first trip out of their village. Sri Aurobindo Rural & Village Action & Movement (SARVAM), an initiative of Sri Aurobindo Society, organized a tour for the women of Poothurai village to the ancient cities of Madurai and Rameshwaram. 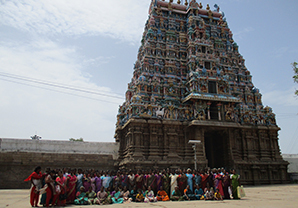 A total of 350 women were able to undertake this trip, from June 18 to July 2, 2015 (in three batches), first to Rameshwaram and then to Madurai. For many of these women, this was the first time in their life that they had been out of their village for an outstation trip, away from their families for any length of time. Once the idea was floated around, it was met with disbelief, scepticism and then finally extreme excitement. All the women who enrolled immediately started saving a little money every month from their meagre earnings so that they would have some spending money during the tour. The entire journey with friends, family and neighbours was great rejuvenation to their body and mind, and they had wonderful time visiting many new places and undergoing new experiences. After reaching Madurai, all their accommodation, food and even snac ks for the journey were taken care by the renowned Dr Nachiyar and the officials of Aravind Eye Hospital. All the women were provided comfortable, clean accommodations and an opportunity to eat sumptuous food, especially prepared in a huge variety for the enjoyment of the guests. 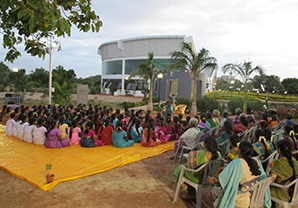 Adding to the fun in the trip, Dr Nachiyar had also arranged cultural programmes, thoroughly enjoyed by all the women, which included a dance and drama programme performed by the Aravind Eye Hospital officials. The women could not stop themselves and joined in to perform a folk dance and sung a few songs at the cultural meet, spreading and share a lot of joy and bonhomie. The trip was a great su ccess and the women came back with hundreds of beautiful memories and a new enthusiasm towards life. All the women are very grateful to Dr Nachiyar, who helped a great deal in arranging this tour and also for wonderful holiday in Madurai. With Divine Grace the entire trip went smoothly and safely without any untoward incident.